‘Phantom X is by far the most high tech putter line we’ve designed to date. This product is so much faster looking, and taken to the next level, that it needed a new name. It’s a major leap in performance. We’ve designed a variety of flange setups, alignment options and shaft bends to offer mallet players more models to choose from. I was inspired by Tour players who’ve asked for slightly smaller profiles with more alignment options and solid face construction. The engineering has been ramped up to an entirely new level to bring this brand new line to life. 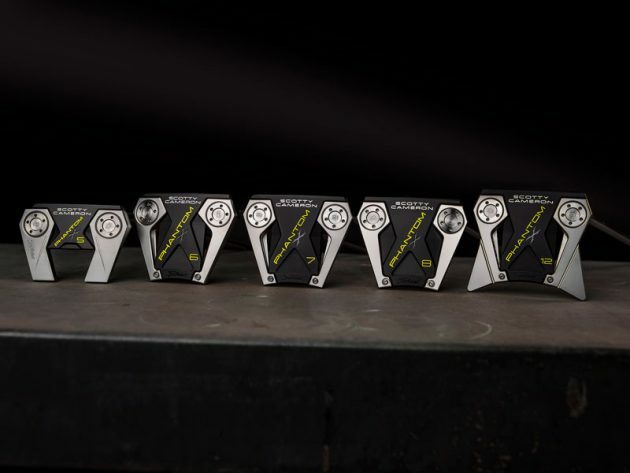 Phantom X is the ultimate lineup for mallet players,’ said Scotty Cameron. A variety of tour-preferred setups offer multiple alignment options, including: continuous lines from the leading edge all the way back; simple sight dots; raised or stepped down flanges; and wider or ‘vanishing’ toplines. Alignment features have been accentuated with longer, racing-inspired lines and triple milled sight dots highlighted in neon yellow paint to frame the golf ball at address. With three shaft options – low-bend, mid-bend and straight – offered across the Phantom X line, players have more choices with regard to their preferred amount of toe flow. Phantom X models with ‘.5’ in the name (i.e., 5.5, 7.5 and 8.5) have a shorter, low-bend shaft configuration with one shaft of offset for more toe flow to promote an arc in the putting stroke. The Phantom X 5, 6, 7, 8 and 12 models have a slightly taller, mid-bend shaft for a near-face balanced setup that produces less toe flow than the .5 models. The Phantom X 6STR has a straight shaft with zero offset. • Phantom X 7: A single mid-bend-shafted, near-face balanced setup, Phantom X 7 features a heel-to-toe tapered aluminum face that is sculpted into a raised center flange for a continuous, connected surface from the leading edge all the way back. Framed by stepped down, angular stainless steel components, the Phantom X7 combines the benefits of long flange sight lines with a semi-traditional topline for easy horizontal and vertical alignment at setup. Also available in a left-handed model. • Phantom X 8: Inspired by touring professionals seeking a putter with simple visual cues and a continuous transition from leading edge through the back flange, the Phantom X 8 is a sleek, near-face balanced mallet with a single mid-bend shaft. Milled sight dots and neon yellow sight lines perfectly frame the golf ball for seamless alignment without distractions. • Phantom X 8.5: Differing from the Phantom X 8 only in shaft bend length and increased toe hang, the Phantom X 8.5 offers players an unbroken, sculpted flange from the putter’s leading edge through the back flange with a single low-bend shaft to promote a slightly arced putting stroke. Alignment is easy with bright visual cues. PHANTOM X WEIGHTING AND SHAFTS: Each new Phantom X putter features advanced stability weighting with two, customizable stainless steel heel-toe weights and stepless steel shafts. FINISH AND GRAPHICS: The Phantom X line’s 6061 aircraft grade aluminum components have been anodized black in a misted finish that helps to reduce sun glare. The 303 stainless steel putter head components have also been misted for a radiant yet glare resistant appearance. Scotty’s familiar three-dot theme carries through to the back cavities of the Phantom X 5, 5.5, 6 and 6STR as unpainted, raw circles revealed by milling away the black anodization. Neon yellow paintfill provides bold visual guidance in sight lines, while sight dots have been double-milled to highlight the neon yellow paintfill with a ring of silver-colored aluminum. AVAILABILITY: Scotty Cameron Phantom X putters will be available worldwide on April 12, 2019, through Titleist authorized golf shops.